To get from Chiang Mai to Koh Phangan, you’ll practically have to travel the entire length of Thailand. Doing so will require two overnight buses or trains, followed by taking a ferry to the island. Alternatively, you can fly the distance in under two hours and then get a boat. Flying is the quickest and simplest way of getting from Chiang Mai to Koh Phangan, but unsurprisingly it’s also the most expensive. There is no airport on the island of Koh Phangan, so you’ll have to choose to fly into either Surat Thani or Koh Samui. Flights between Chiang Mai and the jump-off points to Koh Phangan usually take less than two hours. Thai AirAsia has direct flights between Chiang Mai and Surat Thani: Surat Thani is the busiest port town for catching boats to Koh Phangan and surrounding islands. Bangkok Airways operates direct flights between Chiang Mai and Koh Samui: A large island to the south of Koh Phangan. Flying into Koh Phangan’s big island neighbor is the most expensive option, however, you’ll only be around an hour by boat from Haad Rin beach on Koh Phangan. In a pinch, another option for getting to Koh Phangan is to fly into Chumphon, a port town north of Surat Thani. There are no direct flights between Chiang Mai and Chumphon. The small airport in Chumphon is only serviced by Nok Air flights from Don Mueang Airport in Bangkok. The cheapest and slowest option for getting to Koh Phangan from Chiang Mai is by bus, although all buses and trains will stop in Bangkok. You’ll probably be forced to break the journey up with a stay in Bangkok. With the added time and expense of getting ground transportation and a hotel in Bangkok, flying directly to Surat Thani often works out to be a better deal. The cost of booking an overnight train from Chiang Mai to Bangkok, and then another from Bangkok to Surat Thani, often add up to the nearly the cost of a flight. Plus, you’ll save more than 24 hours of travel time by flying! It's generally pretty easy to get from Chiang Mai to Bangkok. Different ferry companies operate from terminals scattered outside Surat Thani—all are quite far (around an hour or more by bus) from the airport. You’ll need to ensure that you have time to get from the airport to the boat terminal before the last ferry leaves. Combination tickets that include bus transportation to the ferry terminals and the boat tickets can be booked online at the same time that you book your flight. Otherwise, you’ll need to approach one of the handfuls of counters in the airport selling tickets that include a charter bus to the ferry terminal and the boat ticket. Getting a combination ticket at a counter in the airport is much safer (and cheaper) than trying to make your own way to the ferry terminals—a very expensive endeavor by taxi. The different ferry companies operate on schedules that vary by season; you’ll need to check their websites for departure times. Each company varies in level of comfort and amount of time needed to reach Koh Phangan. 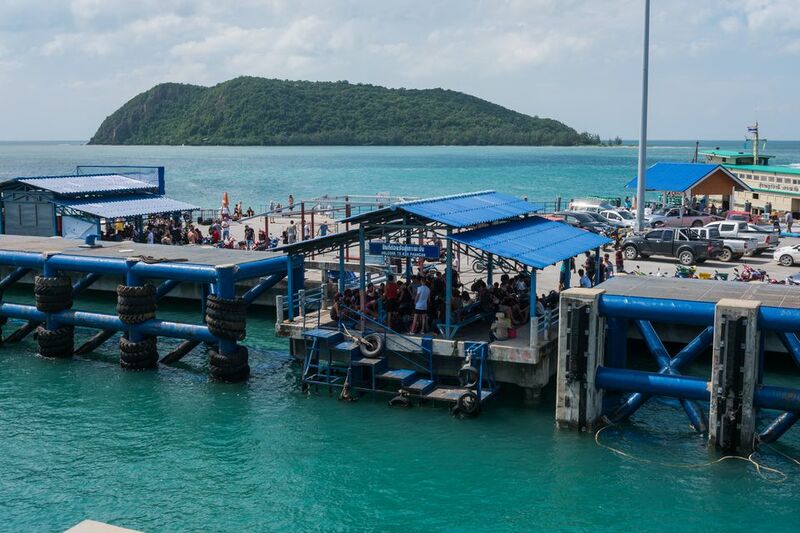 Unless taking the ferry over from Big Buddha Pier on Koh Samui, you’ll arrive in Thong Sala, the main port town on the west side of Koh Phangan. A songthaew (pickup truck taxi) from the port to major resorts and beaches on the island should be around 100 baht regardless of destination. Ferries from Big Buddha Pier on Koh Samui to Koh Phangan arrive at Sunset Beach on the west side of Haad Rin. The monthly Full Moon Party in Haad Rin on Koh Phangan actually affects the migrations of travelers throughout Thailand. Transportation to Koh Phangan can often be sold out the week before and after the popular beach party during high-season months. If you intend to enjoy the Full Moon Party, get to the island early. Otherwise, check dates for the party and stay away from the island when the moon is nearly full!